THE DURDS are Electronic folk/ research-based pop with elements of visual art, experimental sound and performance art. 6 songs played electronically with live vocals plus additional sound and music between tracks. Dan, sits on a chair inside a wooden box, in the dark, singing. An infra-red camera relays images of him to a monitor on top. He cannot see or interact with band or audience, though they can see him. 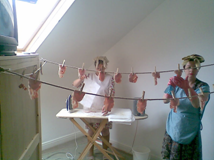 Last time around (at the Arthouse, for the Chorlton Arts Festival) Fliss and Janet ironed and pegged out pegged out bacon dressed as charladies. This time they’ll be wearing negligees and deep frying odd socks. The Durds (AKA The Duds) have a CD album out on Orange County, California's Banazan Records. There are also (under various names) 3 7" singles and a 12" EP on Eeriephone Records.